Sealed Cartridge Bearings, Threadless Internal Cups, Tapered 1-1/8" to 1-1/2"
Locking Mid-Frame Mounted Removable Battery Pack, Stainless Steel Hardware, 1.7 lb 4 Amp Charger, Max Weight ~396 lbs, Rubber Band Clasp for Folding Handlebar, Rear Feet for Vertical Storage, Reflective Tern Decals on Frame, Fits Riders From 4'10" to 6'5"
Tern is internationally recognized and renowned for their high-quality folding bicycles, and electric folding bikes! The Vektron was their first major entry into this category in 2017, using the Bosch Active line system, but they did have a couple of conversion models dating back to 2014 that used the hub motor BionX system. 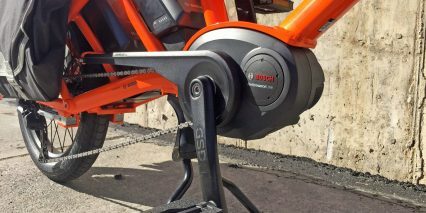 With the GSD, you get a more powerful Bosch Performance Line mid-drive that keeps weight low and center on the frame, an option for two battery packs that can deliver 150 miles of range per charge, and a frame that is stiff, sturdy, and capable of hauling up to 400 pounds of people or goods. 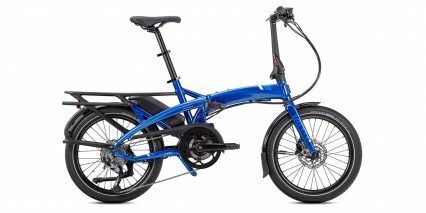 Even though this is technically not a folding electric bike… it does fold a bit. 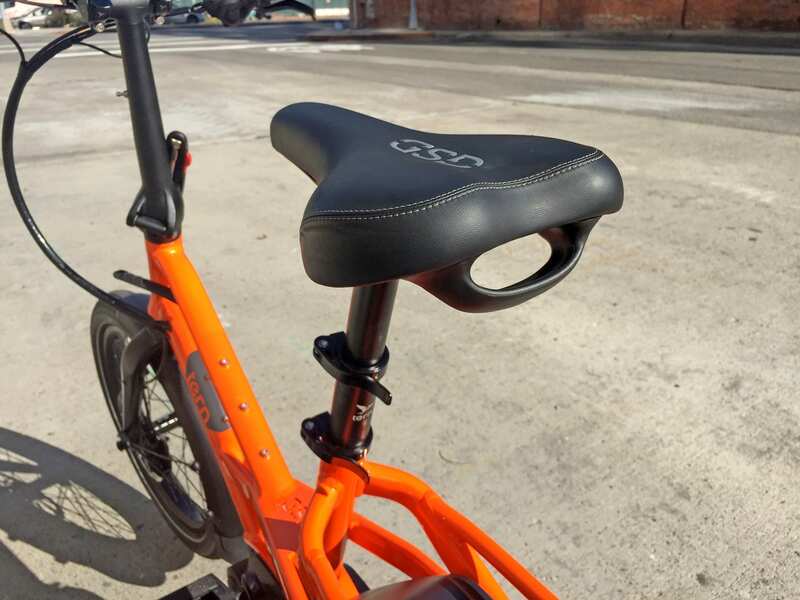 The handlebar post swivels, the stem can be angled completely up or down, and the telescoping seat post uses quick release levers to drop easily. 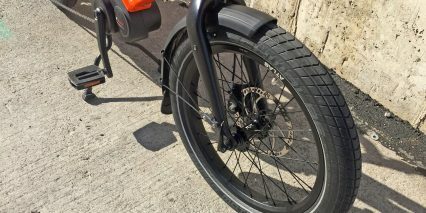 Perhaps the most innovative feature isn’t the folding parts, but the four pegs built into the rear section of the bike and rack that allow it to tip back into a vertical position. And, to be pretty stable in that upright position! 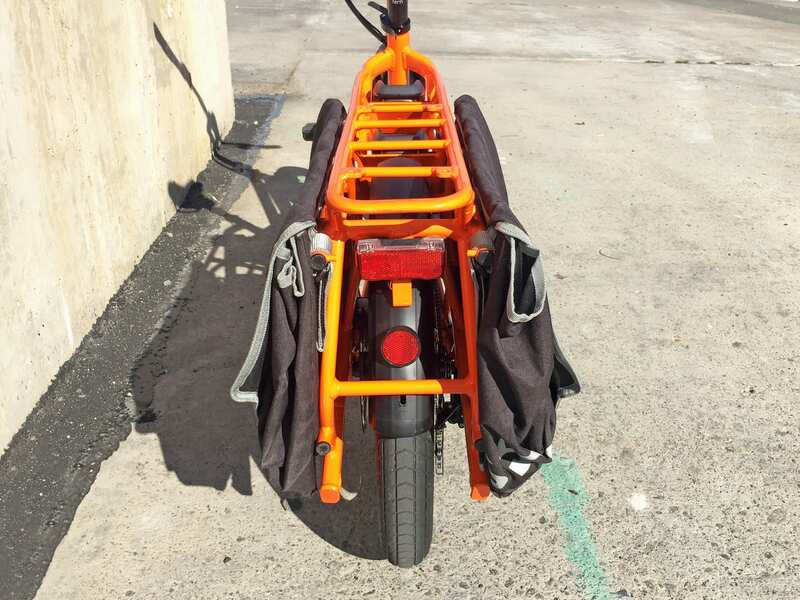 This allows the bike to easily fit into elevators, closets, and other tight spaces that can fit an average sized person (the bike takes up similar dimensions). 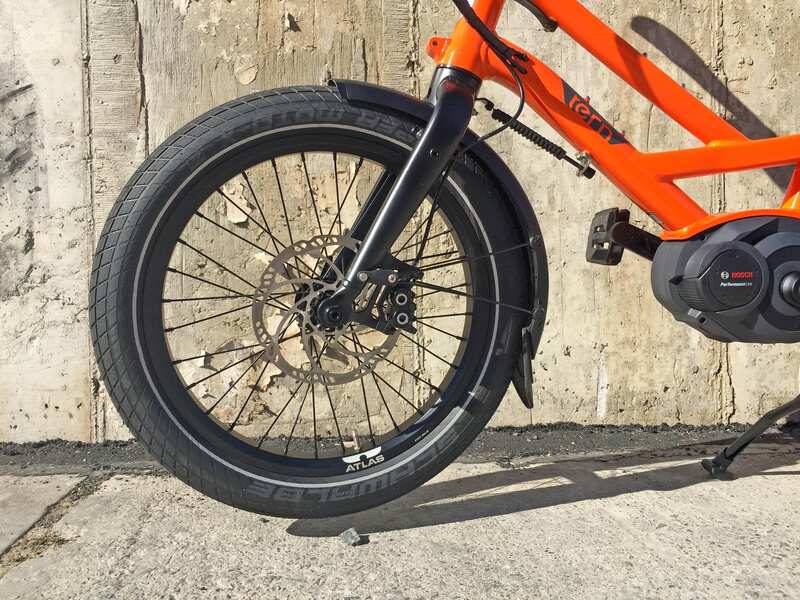 Even though the bike weighs a bit more than an average electric bike at 67.7 lbs, tipping it up isn’t too difficult thanks to premium hydraulic disc brakes. 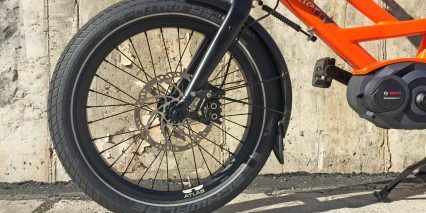 These brakes, along with the tapered head tube, wider Boost hub spacing, and sturdy thru-axles are all reminiscent of a nice mountain bike. The 180 mm brake rotors are very large for such small wheels, and that provides a huge mechanical advantage when stopping. The brake levers are adjustable so they can fit smaller hands and even with one hand filming and the other using the brake I was able to stop with no issues. Yes, with a top assisted speed of 20 mph, fantastic range potential, and plenty of stopping power, my biggest focus when testing the bike was on stability and comfort. And frankly, it’s a bit of a compromise on these fronts. 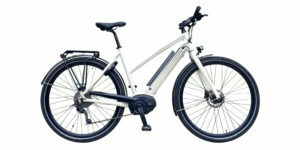 The motor driving this bike is a Bosch Performance Line Cruise. 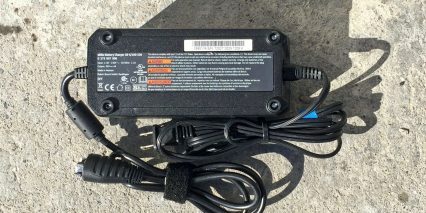 It fits near the middle of the Bosch line in terms of power, and is a step up from the Active Line used on the Vektron folding model mentioned earlier. This motor offers up to 63 Newton meters of torque and listens for rear wheel speed, pedal cadence, and pedal torque signals over 1,000 times per second! 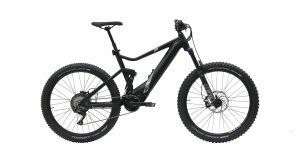 That translates to excellent climbing ability, as long as you switch gears appropriately, and start/stop power delivery that is near instantaneous. 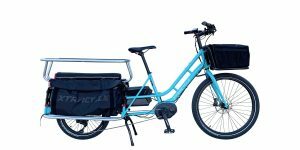 When you’re pedaling through a city environment, with a heavier load, that kind of quick response is critical and it pairs nicely with the strong braking configuration touched on before. The motor is a geared design, and it produces some high pitched whirring noises when operated at full power and pedaling at high RPM… but I love that the motor actually supports faster spinning, up to 120 RPM, while some competing models, and even the Bosch Active Line, only go to 100 RPM. As someone with a sensitive knee, I prefer to spin faster with less force and this higher RPM support also means I don’t have to switch gears as frequently to go faster. When you’ve got a 10-speed cassette to explore as you do with the GSD, it’s nice to be able to achieve a range of speeds with each gear vs. having to use the triggers so frequently. 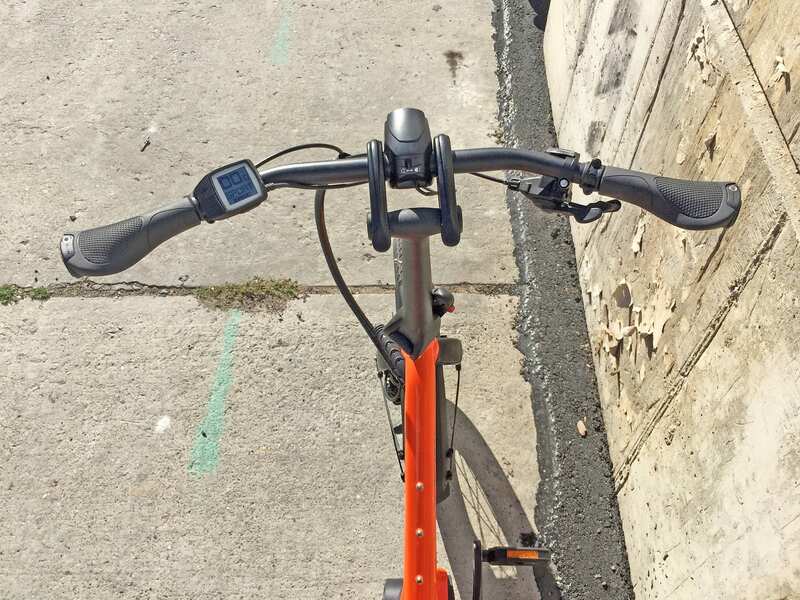 The trigger shifters work well, and are only mounted on the right portion of the handle bar because this ebike uses a one-by drivetrain (only one chainring). 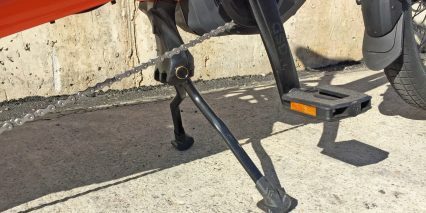 The chain is completely covered at the bottom bracket area to keep your pants or dress grease free, and even though there was some bouncing of the chain, I imagine that it would not drop off easily. One unique hardware feature of the Shimano Deore derailleur that Tern specced here is a one-way clutch lever that tightens the chain when pushed to the up position. 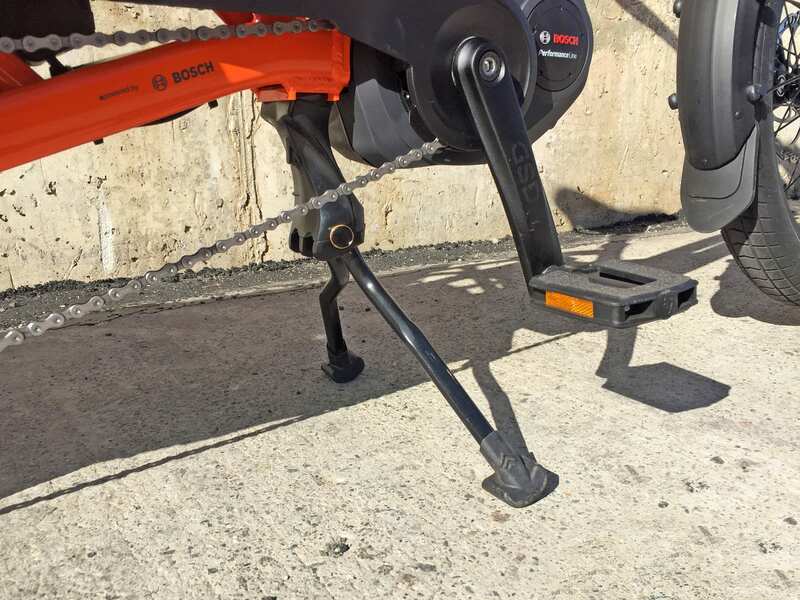 It’s a feature I most frequently see on mountain bikes that encounter a lot of rough terrain, but it’s helpful here because the chain is so long. Overall, this is one of my favorite motors and I feel that the drivetrain is great. Shops and end-users tell me that Bosch is reliable and I know that they have been producing and selling variations of this motor globally since 2013. 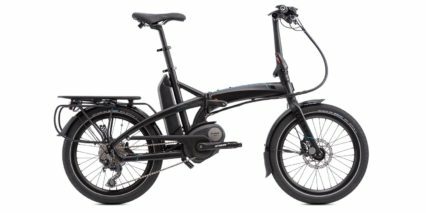 Powering this electric bicycle is the proven Bosch Powerpack 400… which is not quite as exciting as the newer Powerpack 500 (which offers ~25% more capacity and looks the same). 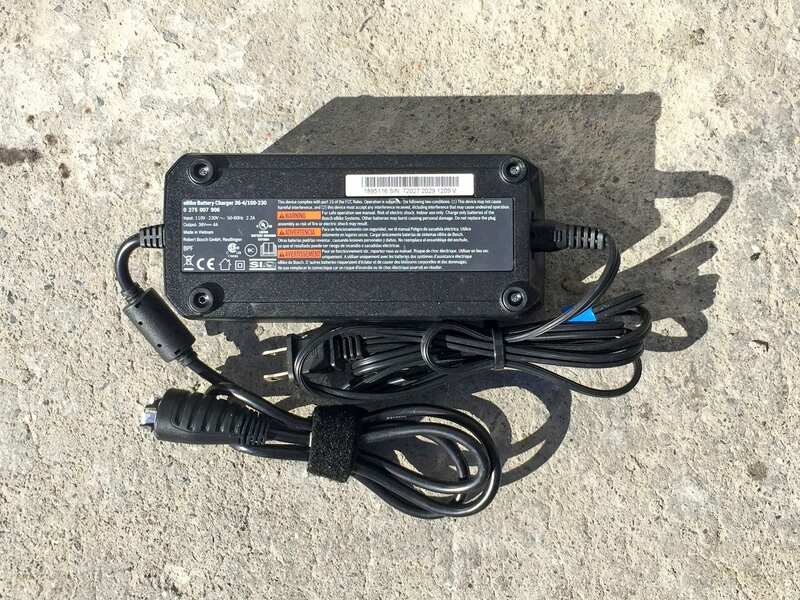 The good news is, the mounting interface on the bike allows for backwards compatibility and can work with the 500 watt hour pack if you want it. 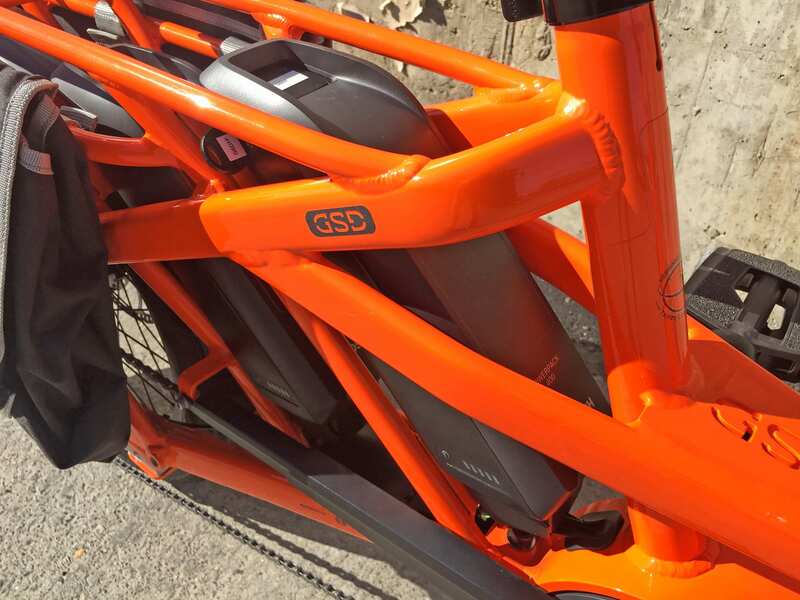 Actually, there are two of these mounting interfaces because the Tern GSD is one of the new double-battery ready e-bikes. You can get an additional Powerpack 400 right out of the gate for ~$800 and effectively double your range. 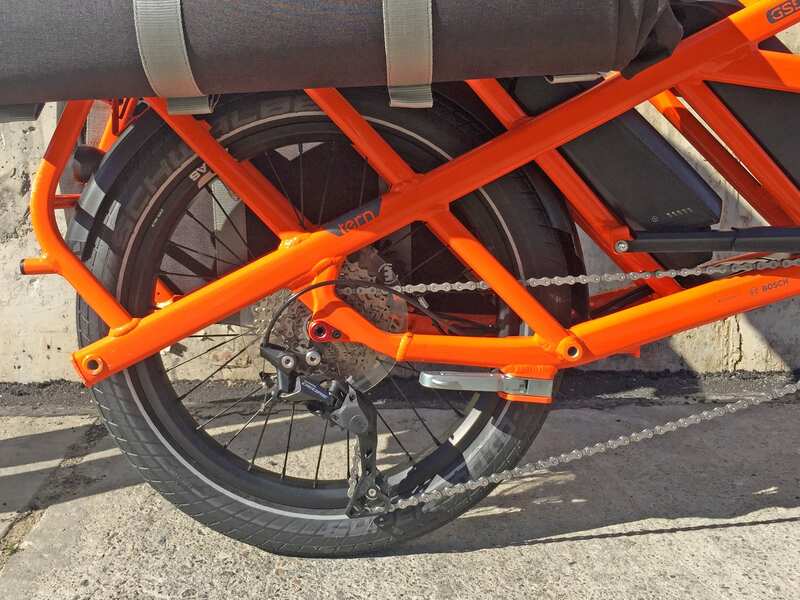 I love that both packs are positioned low and center on the frame while staying out of the way of passengers and cargo and being protected by the metal frame tubing. 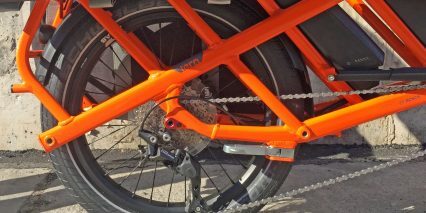 Unlocking and pulling them off can be a little bit trickier than single-battery bikes I have tested, but it wasn’t too bad. 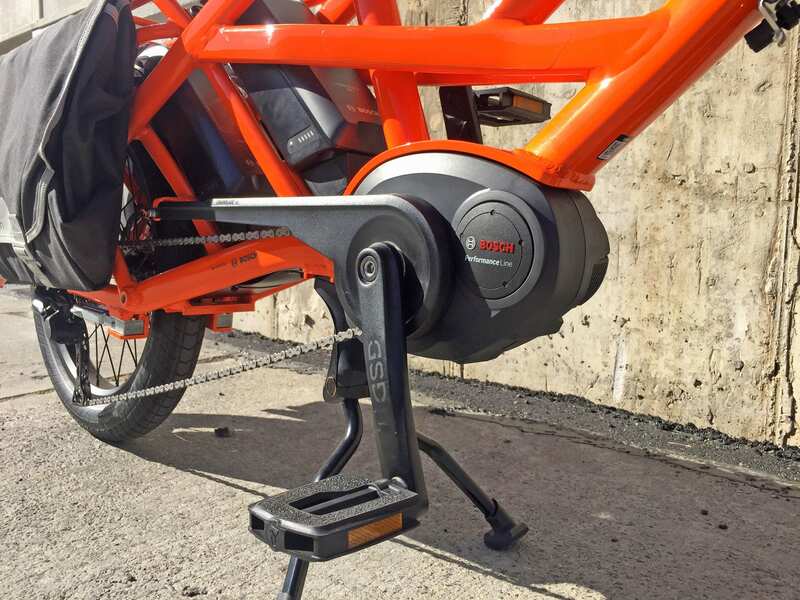 And, one of the coolest design features is that both packs can be charged simultaneously on the frame by plugging the charger into the single accessible slot (for the pack nearest the seat tube). 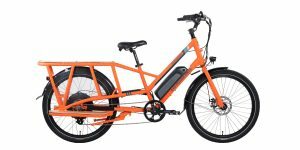 It’s convenient and satisfying to fill this bike up, and it happens faster than many other e-bikes thanks to the Bosch 4 Amp charger. This charger only weighs 1.7 lbs and is compact enough to fit into the bottle pouch at the end of either side-bag that come with the bike. Other things I appreciate about these batteries is that they have a molded loop-handle built into the top for safer transport, an LED power level chart built into the side, and can be charged off of the bike with the same interface (no dongles or adapters required). Weighing in at ~5.4 lbs, I usually take batteries off before transporting my electric bikes by car rack or if I have to lift them, and the front wheel might also reduce weight, and is easy to remove with the quick release system along with the seat post and saddle. Operating the Tern GSD is a snap. Once the battery (or batteries) are mounted and charged up, just press the power button on the top edge of the little Purion display panel near the left grip. The thing turns on quickly and is clear and easy to read. It’s smaller than the popular Bosch Intuvia, doesn’t have a functional Micro-USB port, isn’t removable, won’t swivel to reduce glare, and doesn’t offer readouts like average speed, max speed, clock, or shift recommendation… but it’s less prone to damage and super simple to use. There’s a + and – key built into the left side of the casing and their primary function is to increase or decrease assist power. You can go from Off to Eco, Tour, Sport, or Turbo. The higher you go, the more power is delivered and the faster you may go. The secondary function of these buttons is to activate the lights (by holding plus), or cycle through trip stats (by holding minus). Those trip stats include trip distance, total distance, and range. Range is my favorite because it offers more precision than the 5-bar battery infographic at the top of the LCD screen. 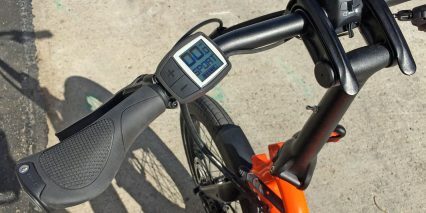 It is calculated based on your remaining battery charge level, chosen level of assist, and the last mile of riding efficiency. The final button on the display is walk mode, which is positioned at the lower edge and requires a push, and then hold of the plus button to use. I was able to enjoy this feature while exploring a crowded park in Brooklyn, New York, and it really made our little adventure fun and relaxing vs. uncomfortable and strenuous. 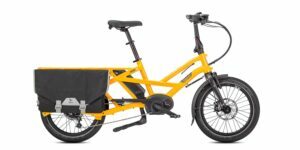 I can only imagine pushing a fully loaded cargo bike vs. the still-heavy unloaded demo model we used for this review. 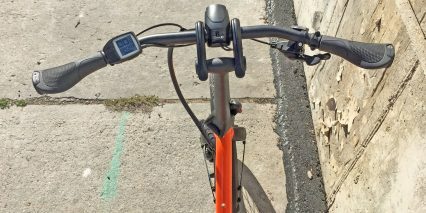 I love walk mode but not every company offers it or even enables it when they do have the same drive system as Tern has used here. It’s a feature that Bosch allows their partners to have some choice on… so thank you Tern! I’d like to finish out this review by apologizing for the extra-close camera work in the video review above. My camera got a bit messed up and recorded on narrow setting vs. medium and that might have been uncomfortable for some viewers. I was so excited to cover this product because it offers something unique and useful in the space. So many companies have different sized frames, different colors, slightly different components etc. but Tern invented the GSD from the ground up. It really can help you “Get Stuff Done” and empower a family to live healthier and have more fun. 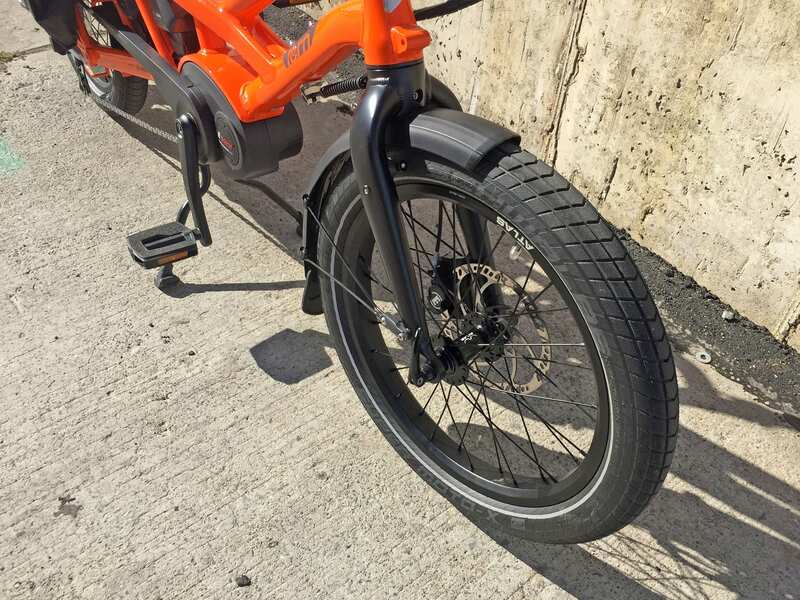 For me, it was a little bit jarring, but the larger tires did make a difference for stability and comfort and the saddle felt nice. I was amazed how stiff it felt to ride with a heavy load on the back and inspired again and again by all of the attention to detail. From the vertical stand design to the folding stem and rubber strap secure feature, the fork spring with quick-release, to flip-out pegs. It’s quite capable, even though it’s compact and the value of the components they used matches or even exceeds the price being charged. I suppose they saved money by only having one frame size but the multiple color choices are great. 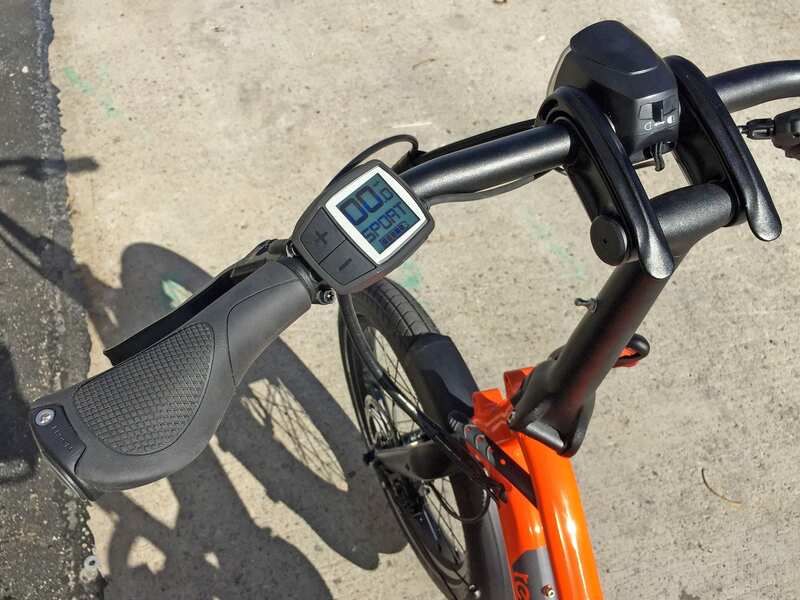 Big thanks to Tern for partnering with me on this review and sending a demo unit out to Propel bikes in Brooklyn for me to film in a city environment. It was neat to see this new model back to back with the Tern Vektron and compare the price and weight. 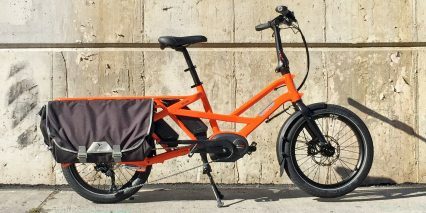 They each have their niche but I enjoy both and am excited to see how Tern refines them over the coming years or expands their offering with even more custom built electric bikes. Thanks for another great review. 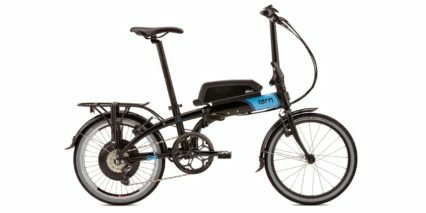 I’d love to try this bike at the Electric Bike Expo in Philly this weekend – Tern, will you have a GSD there for demoing? Hi Joe, I cannot speak for Tern but I do plan on attending with Chris Nolte and some others. Should be a good time! Thanks Court, awesome review as always! 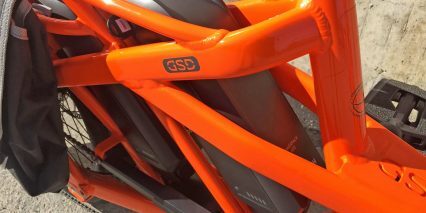 I am on the wait list for a test ride on this :). Thanks, Court, for a thorough review. Are the passenger seat pad and cargorack clip, Vecro or bolt-on? Hi Jon, I only saw the big pannier bags and they used Velcro. I will ask Chris to read and reply to your question, perhaps he or someone else knows? Great. Sorry about the weird spelling – my phone was doing strange things and rewriting some of the words (including Velcro, for some reason). The seat pads clip on and off with a proprietary system. 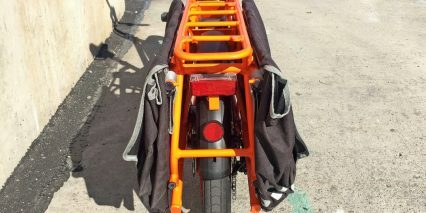 The panniers use velcro and can be put on or taken off in a minute or two. They are designed to be left on permanently. They fold flat when not in use and act as a wheel guard for rear passengers. I keep my lock and bike cover in the panniers so they’re always at hand when I need them. 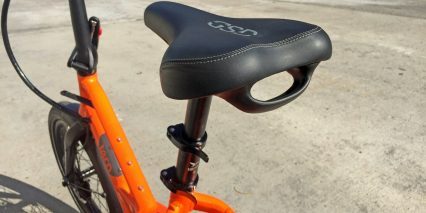 The seat pad uses a KlickFix quick release mount and it takes a second to put it on or take it off. Is the total weight you listed in the specs with 0, 1, or 2 batteries? Just curious since the weight difference would be especially big for this bike since it can have up to 2 batteries. How can the minimum range be lower than the Tern Vektron’s, but the maximum range higher, with the same one battery? Hi Sylvain, I’m not sure it can. My range estimates tend to be very generalized and I have been updating based on what the display panels show sometimes and also what Bosch says. Some companies provide feedback as well and I just haven’t been consistent between all of the reviews. I’m sorry, I hope the estimate provides some guidance but it might vary depending on the rider, terrain, conditions etc. Hello, I congratulate you for the great page you have. 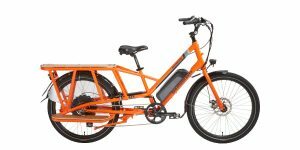 I live in Montevideo, Uruguay and for months I am evaluating buying an e-bike. It’s really hard for me to make the decision. In my country Bosch, Shimano or Brose have no service. There are not many options either. Tern offers the vektron s10 and the gsd. In case of problem it is not very clear how they act, but they have told me that they change the piece. Specialized offers the turbo. In this mark if something happens with the engine is sent to Germany for repair. In both cases they have no possibility of updating the software. The prices are tern vektron U $ S 4,800, Gsd U $ S 5,900, Turbo ford 4.0 U $ S 4,000 and the turbo ford 6.0 U $ S 6,000. These are the alternatives that I have, I know that all are different in what they offer, I like the folding of the Vektron. I appreciate you can guide me since it is a great investment. Hi Federico! Thanks for your patience, it sounds like you have done a great job researching and all of the products you listed are higher quality and should last. 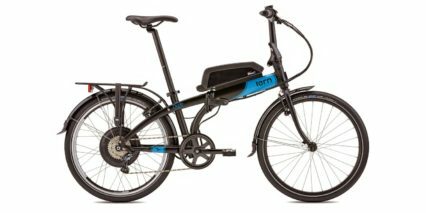 If I were in your position, I would definitely go with the Tern Vektron because it uses Bosch (which is a global brand, well supported) and their motor has been sold and tested longer than the Brose. 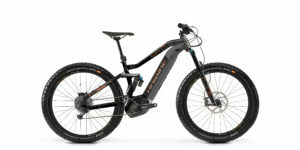 Specialized makes great looking products, but I have heard that their support is more limited at times. 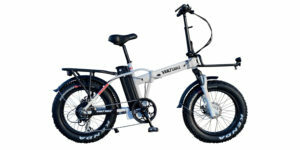 With the Vektron, you get the portability of a folding ebike, the external battery that is easy to replace or find extras for extended range, and it is still sturdy but lighter than the GSD. I guess it really depends on how you intend to use the bike… if you want to do a lot of cargo hauling, the GSD is very sturdy, but the Vektron is also great and it’s nice to be able to fold it if you go by car sometimes and want to bring it along. 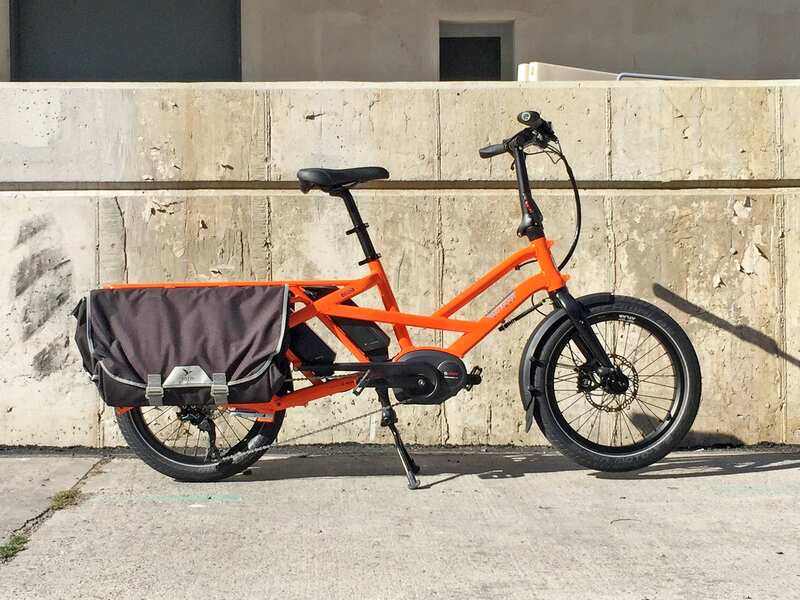 I wish you luck and invite you to share your pictures and experiences (good and bad) in the Tern forums so that other people in Uruguay can learn about ebikes.